Here's a display I've been meaning to share for quite some time. I got this idea from Pinterest, and it turned out just as great as I hoped. 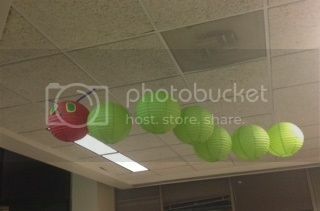 It was simple and fun to put together - all made from paper lanterns I picked up at my local party store. The toughest part was affixing the caterpillar's eyes - the glue wouldn't hold. I ended up very carefully sewing them on. Oh... and the second toughest part was climbing up and down on a ladder and using fishing line to hang this up. I'm really happy with how The Very Hungry Caterpillar display turned out. I got lots of compliments on this one!